The Mercedes-Benz Sedan will rival the Audi A3 Saloon and when it goes on sale in 2019. However, expect Mercedes-Benz to swap the 'sedan' bit for 'saloon' when the car reaches the UK in April 2019. 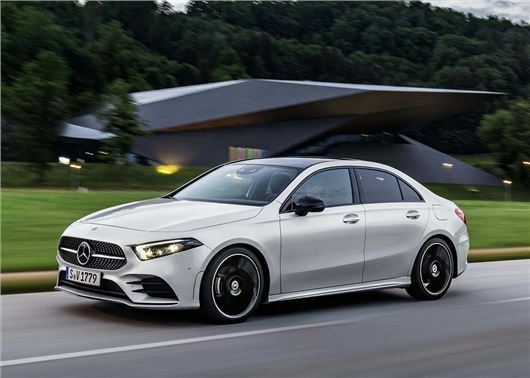 Despite the visual similarities with the CLA-Class, the compact saloon will share its platform with A-Class hatchback and offer more interior space with a longer 4549mm body. This means rear passengers should get more head and legroom, while bootspace has been increased to 420 litres. However, owing to the saloon shape, the boot opening will be 300mm narrower than that of the hatch. There will only be two engines to choose from at launch: a single petrol and diesel. The A200 will use a 1.3 turbocharged petrol engine with 163PS while the A180d will be powered by Renault-sourced 1.5 diesel with 116PS. Peak economy for the petrol and diesel will be a respective 54mpg and 70mpg and both will use a 7G-DCT automatic gearbox. Manual transmissions and a 2.0-litre petrol engine will be added to the A-Class Saloon range in late-2019 and followed by a high performance 400PS+ AMG version in 2020. A fully electric model is also thought to be in the works, with Mercedes-Benz promising to launch 10 all-electric models over the next 18 months. The interior will be the same as the A-Class hatch, as will the impressive array of semi-autonomous tech that will allow the car to effectively drive itself under human supervision with automatic cruise control, active lane change assist and autonomous braking. The A-Class cabin is among the best of any small car on sale right now and little is expected to change with the launch of the saloon. Entry-level models will get a fully digital dash with a pair of seven-inch screens while the range topping models will get widescreen wraparound 10-inch HD displays. The line-up of wheels ranges from 16 to 19 inches and Mercedes-Benz is promising S-Class rivalling refinement with low road and wind noise noise. What’s more, with a coefficient drag of 0.22, the German carmaker is claiming that the A-Class saloon will be the most aerodynamic in the world. Click play above to watch our video overview of the A-Class Saloon. I have a real problem with paying a high price for a premium car that uses Renault-sourced engines. Such a shame that brands once respected for their engineering excellence and reliability have succumbed to the bean counters, usually resulting in a far inferior product (but not a cheaper one).